Welcome back for day 6 or 30. I hope you have been enjoying the content so far. It has been interesting finding the topics to write about each day and if you haven’t noticed I have been going with the things that have inspired me over recent days. Let’s start off with a lovely surprise I found today. 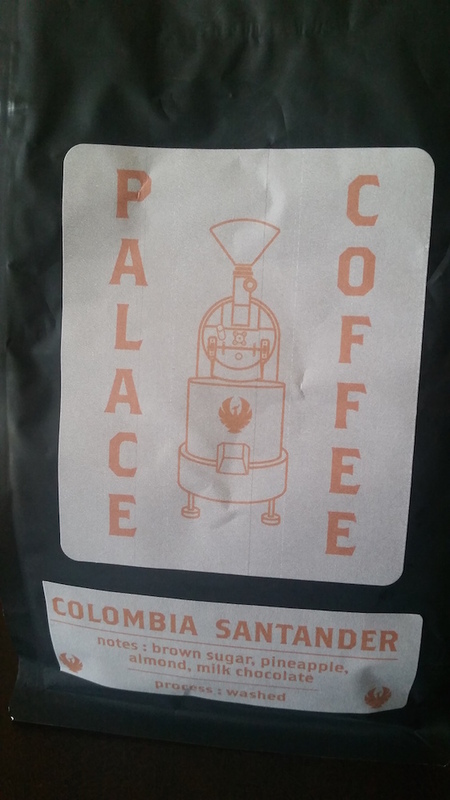 While I was out in LA over the past week my reward package for funding Palace Coffee’s Kickstarter arrived! We received a bag of coffee, a mug, t-shirt, pin, and a hand written note. They just started roasting and are already doing a great job! I look forward to tasting more of their coffees in the near future. Great people, like those at Palace, make the coffee industry so fun and fulfilling. Commonly we make a big deal about relationships in coffee, and a lot of us automatically think about the farmer/buyer relationship in particular. But we establish important relationships everywhere, not just when we visit coffee farms at origin. Earlier today I had an interaction with my old colleague, Dean (Kostantinos) Kallivrousis. Dean has been a bit of a fanboy as long as I have known him, and if you know him too you probably know what I’m talking about. Being an exuberant fan of others, as well as a rather consistent presence on social media, has made Dean into one of those guys that everyone seems to have crossed paths with. He is always moving and socializing, which is impressive to me because I don’t consider myself the best at those things. Anyway, Dean brought up the topic of ‘What is coffee quality to the consumer?’ and I would love to discuss it. I consider myself a “quality” guy when it comes to coffee, which means that quality of product is imperative to how I operate. When we talk about quality from the consumer’s point of view, it is an enormous target to hit because there are so many different expectations of how coffee quality is defined. Bold and dark, sweet and smooth, fruity and bright, full bodied and strong, low roast flavor, high roast flavor, the general coffee drinking community is all over the board with what they like. But they DO like something! So here is what this boils down to for me. Coffee quality for most people is drinkable, it is consistent, and it exceeds their base flavor expectation. Unfortunately in the US the base flavor expectation is highly bitter, smoky, roasty, and stale (basically 1st wave grocery store coffee). So places like Starbucks can make millions of fans by barely exceeding this expectation. I don’t necessarily see this as the fault of Starbucks, as they are just selling what meets their customers’ needs. The fault is in our inability to raise the expectations of the masses. When we present “high quality” coffees, what is our criteria for defining that quality to people? Saying the proof is in the cup can work if they taste it next to inferior coffee. Most of the time we don’t do that. Having a high price only tells the consumer that we have paid a lot for it. I can pay a lot for Kopi Luwak. Does that make it better? Nope! We have to show better products in large scale to the majority of people, show them why it is worth the money, and give them a reason to want to buy it. We will always lose out to the super big companies if we can’t give a cohesive message with a consistent flavor experience that can be counted on time and time again. We have been doing this on the small to medium scale, and we have seen the results. Companies like Blue Bottle, Stumptown, Intelligentsia, and Counter Culture are becoming recognized names in public, and there seems to be an understanding that the specialty companies are doing something of higher quality than Starbucks and Peet’s. Exactly what they are doing seems to be a bit of a mystery though. It does in fact take time, especially when we serve a small percentage of coffee drinkers on a regular basis. So remember that when getting consumers on board with your own coffee quality, their personal expectations don’t always change as fast as we want to grow as an industry. There are still needs for simple flavor profiles as well as the occasional “dark” roast. If you know your consumers they will get on board, and then you can convert them to more and more special coffee over time. It’s the only way to bring the masses along with us. That’s all for today. If you are enjoying these posts, please share them with your friends!